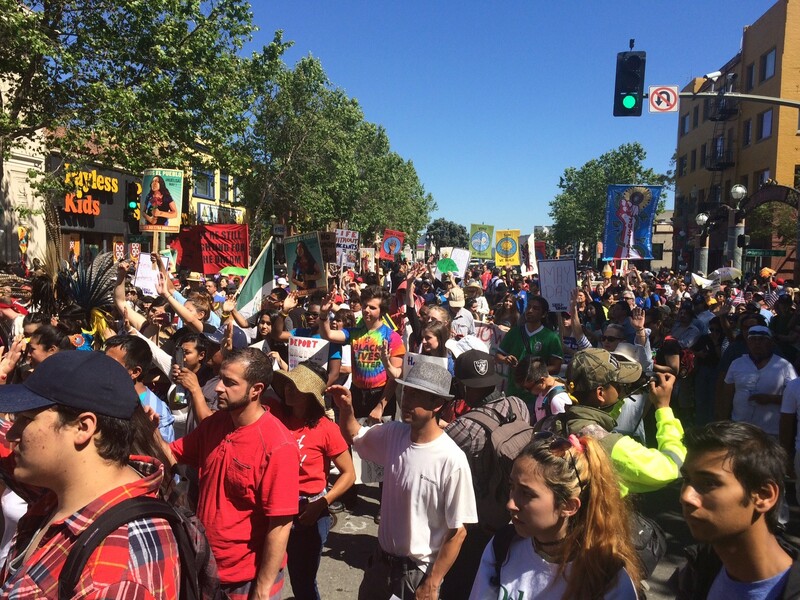 The heat wave was no match for the estimated 5,000 people who marched on International Workers’ Day, also known as May Day, yesterday in Oakland. The day began with an act of civil disobedience: a group of protesters blockaded the Alameda County Administration Building in downtown Oakland, demanding that Alameda Sheriff Gregory Ahern end collaboration with federal immigration agents who have access to the county's jails, and also cancel the "Urban Shield" SWAT training and weapons exposition hosted by his agency each year. They are also opposing the planned expansion of Santa Rita Jail, and many want the county to strengthen its sanctuary policies that shield immigrations from federal enforcement. 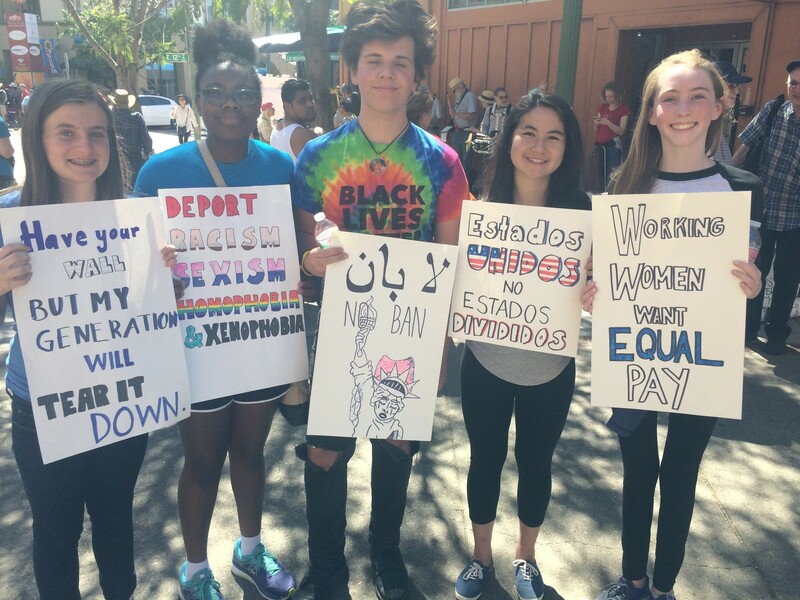 Across town in Fruitvale Plaza, students from over ten high schools organized a walk-out and rallied at the corner of 35th Avenue and International Blvd. The sentiment among them was the same. They were marching for their undocumented family members and friends who have been targeted, and demonized by the Trump administration. “Beautiful Brown, African, Asian people, this is not what the Trump regime wants to see,” the Anti-Police Terror Project's Cat Brooks told the rally. The protesters marched from Fruitvale to San Antonio Park with a sea of signs and messages: "Sanctuary for ALL," "My students and their families are not criminals," "No human is illegal," "Legalization, not Deportation." The rally concluded at San Antonio Park in East Oakland, where organizers offered trainings on what to do in case of an ICE raid, and an art exhibit by the Palestine Youth Movement. 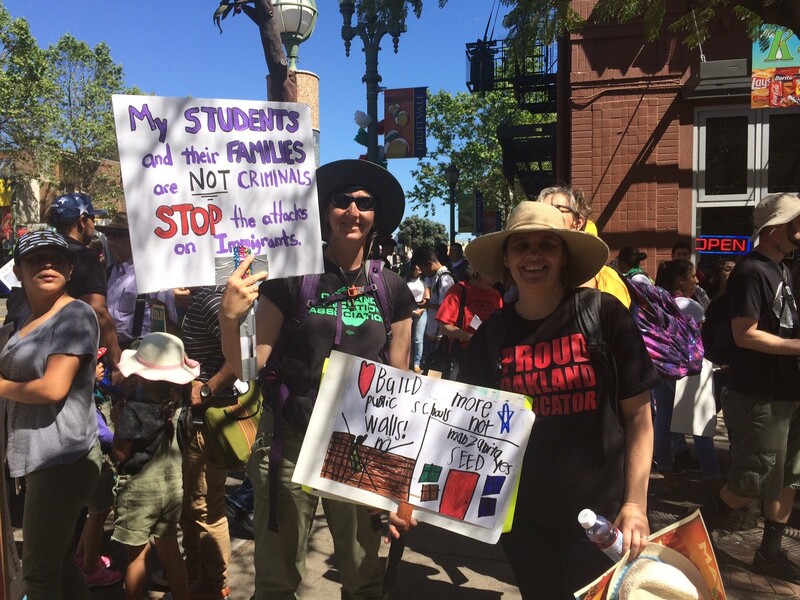 "As the attacks on immigrants, workers, and communities of color are increasing under Trump's administration, we are mobilizing in the thousands to demonstrate our power and resistance against the fear and violence that this government is imposing on our communities here and abroad," said Sharif Zakout of the Arab Resource and Organizing Center during the march.